After due deliberation following Rogers' death in 1882, the membership of the Academy selected Othniel Marsh (1831–1899) as his successor. He served for twelve years (1883–1895). His ancestry was composed of New Englanders of English origin. He was born in Lockport in western New York where his father had a farm near the Erie Canal. Unfortunately his mother died of cholera when he was three years of age. While growing up, he had good relationships with his stepmother and her children but was often in conflict with his father. As a result, he did not spend much time at work on the family farm, but preferred to wander about the countryside observing nature. The Erie Canal was undergoing widening in their area, and he began to collect fossils revealed by the diggings. In the course of this activity, he fell under the influence of an expert paleontologist, Colonel Pickering, from whom he learned much and began to proceed more systematically in developing his collections. Initially he took his formal education fairly casually, although he did receive sufficient certification to be able to teach in grade schools, which he did not particularly enjoy. All this changed abruptly in 1851 when he was twenty years old. He suddenly decided that he wanted the best education possible and entered the Phillips Academy in Andover, Massachusetts. He used the first year for orientation but then took off as a brilliant scholar, winning all of the prizes and awards within his reach. On graduating he decided to further his education and entered the Classical Course at Yale University. Here he was both encouraged and supported by a very wealthy uncle, George Peabody, his mother's brother. He did creditably well at Yale, but hungered for further education directed towards natural science, his first love. In consequence, he spent the next two years at Yale in the newly created Sheffield School of Science where he was tutored by some of the best naturalists in the country. By 1862, Marsh had determined that his goal was to obtain a professorship at one of the leading American universities, which could be aided by gaining further experience at some of the distinguished institutions in Europe. His uncle agreed to support him in this venture, so he took off for Europe with letters of introduction from members of the Sheffield School of Science. He spent much of the next four years in Europe, principally in England where his uncle resided, and in Germany and Switzerland. In the course of this activity he came to know personally some of the great European scientists, including Sir Charles Lyell, Sir Charles Darwin and Thomas Huxley. Thereafter he spent much time in Europe, although firmly based in America. In the meantime, his uncle had decided to provide Yale with a gift of $150,000 to create a museum of natural history. In 1866, Marsh received an appointment as professor of paleontology at the Sheffield School of Science, but he transferred to Yale College in 1879. He promptly proceeded to become the pioneering leader in American paleontology.The chance discovery of the bones of gigantic reptilian vertebrates in the western plains and in the region around the northern end of the Rocky Mountains caught his attention and he proceeded in a highly professional way, using his own funds as well as those from whatever private or public sources he could find. He hired scouts to follow up early discoveries and provided instructions so that his staff could retrieve specimens in an efficient and nondestructive manner. This involved adding to the practical science of recovery along with the science of interpretation. In the process, he displayed all the enthusiasm of an avid stamp collector, being thoroughly immersed in his medium. His findings went far beyond quantity, although he filled museums with specimens of high quality. They included, for example, the discovery of many species of dinosaurs, including relatively large flying reptiles (pterodactyls) and toothed birds. He demonstrated beyond doubt that the horse had emerged first in the Americas and had undergone its early evolution there. It then migrated to the Eurasian continents over some land bridge before becoming extinct in its original homeland. One of his important studies involved determining the ratio of brain size to bone weight for the dinosaurs and their ancient reptilian relatives. He had noted that the brain cavities of these creatures were relatively tiny compared to those of modern mammals of comparable size. A systematic study of the fossil brain cavities of ancient mammals demonstrated, however, that their brain/bone ratio also was small in the early stages of evolution, but increased substantially in the course of geological time, indicating a gradual increase in intelligence. One might conclude that the main occupation of both the dinosaurs and the early mammals was the search for food and procreation. Down, Kent, August 31, 1880. I received some time ago your very kind note of July 28th, and yesterday the magnificent volume [Odontornithes]. I have looked with renewed admiration at the plates, and will soon read the text. Your work on these old birds and on the many fossil animals of N. America has afforded the best support to the theory of evolution which has appeared within the last 20 years . . .
Marsh was made Vertebrate Paleontologist of the Geological Survey in 1882 and held the position until his death. He was of great help to Powell during the latter's happier years as head of the Survey. When he became president of the Academy in 1883 he continued the search for skeletons of ancient vertebrates that were being found in the western lands of the continent. The question has arisen, shall the Academy, in addition to the duty of giving advice when asked, volunteer its advice to the Government? Members of the Academy have urged this course at various times in the past, and during the present session the question has come up again for decision. My own opinion on this subject, after careful consideration, is against such action. The Academy stands in a confidential relation to the Government as its scientific adviser, and in my judgment it would lose both influence and dignity by offering advice unasked. In appointing committees on the part of the Academy, I informed them that the proper province of the National Academy is not merely to make a technical examination of any case, but especially to bring out the scientific principles involved in the investigation, as basis for future use. Marsh, a bachelor, did not always possess a warm friendly personality and frequently carried on feuds with his scientific rivals, some with closely controlled ferocity. He was, however, also known to be very convivial at gatherings with close friends. He was offered another six-year term as president in 1895 since he had been an excellent leader in the managerial sense, taking the post quite seriously. He refused, probably because he sensed some underlying unrest within the membership on a number of issues, such as the absence of sections. It is worth mentioning at this point that Marsh's period in office coincided with the emergence of one of the great technological revolutions that is based directly on fundamental research, essentially at the academic level, namely disclosure of the inter-relationships between the force-fields involved in electro-magnetic phenomena. While the simple electric form of telegraphy that depended on the magnetic fields generated by electric currents had been exploited since the 1830s, James Clerk Maxwell's development in the 1860s of the equations governing the detailed interrelations between electric and magnetic fields permitted much broader utilization of electromagnetism as a result of more precise understanding. The construction of motors and generators could now proceed on the basis of sound principles. Maxwell had pointed out that visible light is probably electromagnetic in nature. 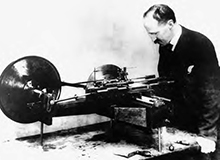 By the late 1880s Heinrich Hertz, prodded by Helmholtz, was producing electromagnetic waves of arbitrary length in the laboratory. Whereas North America had heretofore been mainly a follower of Europe in the utilization of science-based technology, it was now prepared to compete at the frontier in this new area as individuals such as Thomas A. Edison and the Canadian Reginald A. Fessenden emerged among leaders on a global scale. Edison gave a demonstration of his phonograph at the annual meeting of the 1927. He established the first industrially oriented research laboratory in the country in New Jersey in 1876. It should be added that Marsh's term in office also coincided with the period in which professionally trained chemists began to take over analysis, testing and control of many manufacturing fields, such as those dealing with ceramics, metallurgy and the preparation of pigments, paints, enamels and dyes. Hitherto, these had been in the hands of what might be termed ‘traditionalists' who had based their products on generations of testing by trial and error. The scientific approach was extending everywhere, not least to agriculture. It was, however, during this period that Henry Rowland (pictured right), on retiring as the first president of the American Physical Society (1899), lamented the fact that so much effort within the American scientific community was devoted to practical applications rather than to the discovery of fundamentals. In the lecture, he provided a brilliant summary of the leading unsolved problems of the time. He hoped for a day when there would be more balance. That day was not far off, although Rowland was not to see it as a result of an early death caused by then untreatable diabetes. Anticipating his death, he had diverted his interests to the development of the Teletype machine in order to provide an income for his family. The growth of general interest in science in the country is indicated by the fact that Alexander Graham Bell and a colleague were able to start and sustain the journal Science in 1883. It was eventually taken over by the American Association for the Advancement of Science, which had been founded in 1847. The Congress soon realized that in one way or another it was not only being compelled to make decisions that involved scientific input, but also that the federal agencies were beginning to add many scientifically trained individuals to their staffs. The question arose: “Should there be consolidation?” The matter was referred to the Academy in 1884 with the recommendation that it organize a study committee with very broad membership, not limited to that of the Academy. With the help of Congress, Marsh selected such a committee whose studies were carried on between 1885 and 1887. The official chairman was Senator William B. Allison, of Iowa, after whom the committee was named. The principal conclusion drawn was in opposition to consolidation. It was felt that the need for scientific advice would be increasingly diverse and could not be encompassed within a single organization. Flexibility was important. Representative Theodore Lyman (1833–1897) of Massachusetts, a member of the Academy, provided much guidance. Lyman was a well-known naturalist, having published a number of papers describing the details of native plants and other matters. The popularity that won him a seat in the House stemmed from his military service in the Civil War. He was on the staff of both General Meade, the victor at Gettysburg, and General Grant. He was involved in a number of battles, including Vicksburg and the final campaign leading to Appomattox. He became a lifelong friend of Meade. Perhaps the second most important conclusion that emerged from the study centered about the need to standardize commercially used weights and measures. Previously this responsibility had been linked to the Coast Survey. The new review ultimately led to the creation of the National Bureau of Standards (1901). At start the Bureau was attached to the Treasury Department but now resides in Commerce. Attempts to have the metric system adopted universally in the country, for use beyond scientific measurements, failed then and have continued to fail since.